On tent picquet – boys have chameleon on tent rope for catching flies. Spent day in writing. Had my first swim – water beautiful & clean but rather warm & not very refreshing. Skin now getting rather brown. Swim during morning. Pay afternoon. Procured tickets for Jerusalem trip tomorrow(?). Left camp on trip at 8AM. Arriving at Jerusalem at 11AM. Straight onto Bethlehem – reaching Church of Nativity – star(?) & manger then to British War Cemetery. NZ paid for decorating of chapel. Some wonderful mosaic work & really a credit. Journeyed to Mt of Olives next. Saw foot print that Christ left when he ascended to heaven. Caught a glimpse of Dead Sea. Returned to Jerusalem for lunch. Afternoon taken over the Way of the Cross. Saw Garden of Gethsemane in which stands Church of All Nations & Church of Virgin Mary. Visited Pilates residence then followed Our Lord’s path to Calvary stopping at the various stations. Saw place where Christ died & Holy Sepulchre – wonderful jewels of Statue of Virgin Mary. Afterwards saw Wailing Wall then to Jerusalem and went through the million dollar American YMCA – beautiful building and grounds. Brought many snaps of trip. Arrived back in camp at 10 o’clock. To see his photos of the British War Cemetery click here. 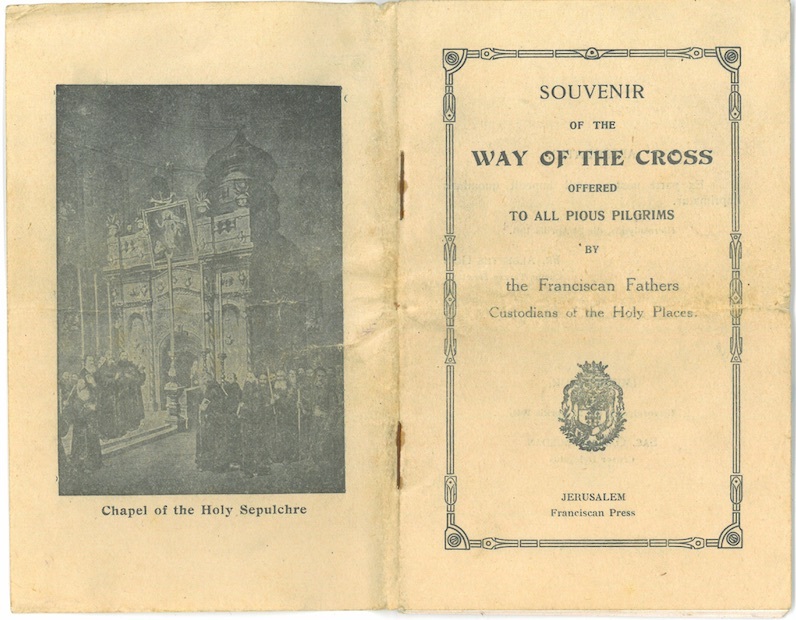 To see a Souvenir of Gethsemane click here. To see his photos of Church of All Nations & Church of Virgin Mary click here. Met W Morris. Weather very warm. Spending time swimming. “…followed Our Lord’s path to ??? stopping ” is “…followed Our Lord’s path to Calvary stopping”.